Cognitive radio network (CRN) is an upcoming networking technology that can utilize both radio spectrum and wireless resources efficiently based on the information gathered from the past experience. There are two types of users in CRN, namely primary and secondary. PUs (PU) have the license to operate in certain spectrum band while the secondary (SU) or cognitive radio (CR) users do not have the license to operate in the desired band. However, they can opportunistically utilize the unused frequency bands. Spectrum sensing, spectrum management, spectrum sharing, and spectrum mobility are the four major functions of cognitive radio systems. The main objective of spectrum sensing is to provide better spectrum access to CR users, without causing any harmful interference to PUs. 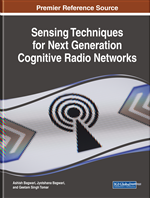 Sensing accuracy is considered as the most important factor to determine the performance of cognitive radio network. In this chapter, the challenges and requirement involved in spectrum sensing are detailed. Further, various spectrum sensing basic techniques are also discussed in detail. In CRN, the spectrum sensing function, measures the metrics related to operating environment. They are white spaces, noise, signal power, temperature and interference status. Whenever the frequency band is detected to be unused over a period of time by the PU located in a particular position, then it can be assigned to the CR user. This function can be executed in four different dimensions namely time, frequency, space and code (Ali, & Hamouda, 2017). In practice, to identify the presence of the Spectrum Hole (SH), the CR user seamlessly monitor the activities of the PUs who are the licensed users to operate in a particular frequency band. This procedure is known as spectrum sensing (Wang, 2009). The principle of spectrum sensing is illustrated in Figure 1. Let P, Q and S, T be the PU and CR user transmitter-receiver pair respectively. It can be observed that the PU transmitter is sending data to PU receiver in their allotted licensed spectrum band. At the same instant, if a pair of CR user also intends to access the spectrum, then in order to protect the PU transmission, spectrum sensing mechanism should be performed by the CR user transmitter, in which the presence of PU receiver that is present within the coverage of the SU transmitter is determined (Subhedar & Birajdar, 2011). The unused portion of the authorized spectrum band that can be utilized by CR users is known as spectrum hole or white space. It is illustrated in Figure 2 (Bountouris, 2013). There are two types of Spectrum Holes, namely temporal and spatial. The spectrum hole is said to be temporal, when the PU does not access the authorized spectrum band over a specific time. If both PU and CR user are located in the same geographical area, then they may interfere with each other, when they attempt to transmit over the same spectrum band. This can be alleviated by allowing the CR user to exploit spectrum holes before transmitting data over the spectrum. The spectrum hole is said to be spatial when the access of PU transmission is restricted to specific geographical area. The region outside this area can be accessed by the CR user. This is possible in relay assisted CRN. In this section, the challenges in spectrum sensing, namely hardware equipment prerequisites, hidden PU issue, sensing periodicity and noise uncertainty are discussed (Sahai, Hoven, Mishra, & Tandra, 2013).